Rapid determination of biomass composition is critical to the breeding and selection of shrub willow varieties with optimized properties for downstream conversion. If shrub willow is to be used as a feedstock for the production of bioproducts or biofuels, the bioconversion process must become more efficient and cost effective. This can be partially achieved by selecting varieties with biomass composition that are better suited to the conversion process. Lignocellulosic biomass displays considerable recalcitrance to biochemical conversion because of the inaccessibility of its polymer components to enzymatic digestion and the release or production of fermentation inhibitors during pretreatment. If the ratio of hemicellulose, cellulose, and lignin in a woody biomass feedstock was optimized for the specific biochemical conversion method, then expensive and chemically harsh pretreatment methods could be reduced or avoided. Larry Smart’s group is currently optimizing several analytical methods for the characterization of shrub willow biomass. 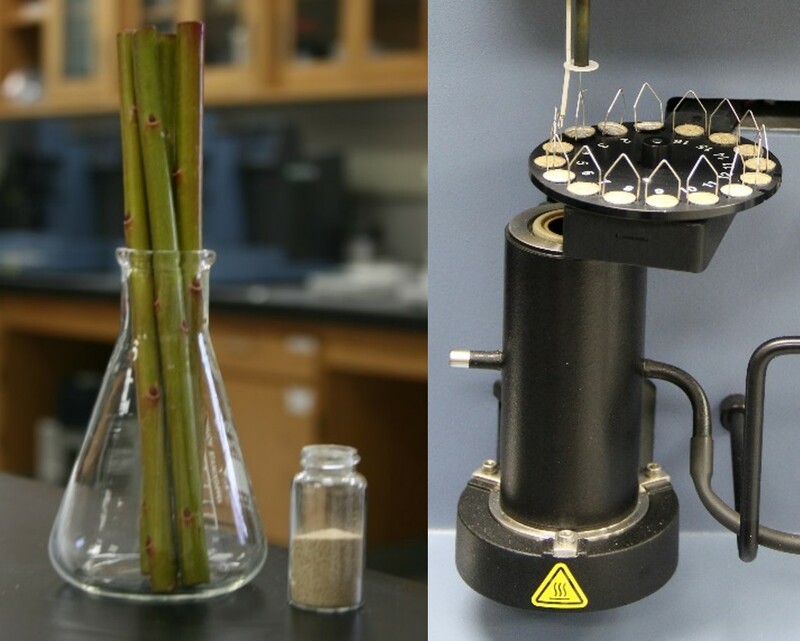 Traditional wet chemical analysis based off of the TAPPI methods has been performed on 25 individuals to develop a small calibration set of willow standards. Two, rapid, low cost instrumental-based analytical methods are currently the focus of the willow research at Cornell University: high resolution- thermogravimetric analysis (HR-TGA) and Fourier transformed near infrared spectroscopy (FT-NIR). Comparative analysis and the integration of both FT-NIR and HR-TGA as methods to characterize the diversity of the current varieties generated through willow breeding, will be key to selecting feedstocks custom tailored for conversion to renewable energy. Improvement of both of these methods will be implemented by utilizing a more robust calibration set of shrub willow standards. This is currently in production and will consist of more than 100 clones produced in the willow breeding program and will be available to the public. Through collaboration with Dr. Arthur Stipanovic, HR-TGA has been established as a method for biomass compositional analysis to screen hundreds of shrub willow varieties. Quantifying variation in chemical composition of biomass from a genetically diverse mix of commercial and pre-commercial varieties using this rapid technique has been very successful. The HR-TGA method involves the accurate measurement of sample weight during the combustion or pyrolytic process as the furnace chamber increases in temperature at a regulated rate. HR-TGA has the ability to qualitatively and quantitatively determine a complex mixture of polymers following the principle that each component has a unique decomposition temperature. Woody biomass is a complex mixture of three polymers, cellulose, hemicellulose, and lignin, and thermogravimetric studies of its pyrolysis and combustion have shown that decomposition occurs in four separate phases all occurring within distinct temperature ranges. In collaboration with Dr. Stéphane Corgié, the development of FT-NIR chemometric models for the prediction of cellulose, hemicellulose, and lignin content in shrub willow biomass are currently in progress. FT-NIR spectroscopy has a wide range of applications and has been very useful in the analysis of many physical properties of wood, including moisture content, density, calorific value, specific sugar content, cellulose crystallinity, in addition to chemical composition. Future work involves the development of FT-NIR as a complementary technique to the analysis of shrub willow biomass by HR-TGA.